Pasay City, Philippines, 2019-Feb-01 — /Travel PR News/ — The Philippines’ leading airline, Cebu Pacific (PSE: CEB), is set to receive 12 brand new aircraft in 2019, to support the carrier’s expansion plans this year. The aircraft deliveries include six Airbus A321neo; five A320neo; and an ATR 72-600. The A321neo boasts of 236 seats, 56 seats or 31% more capacity versus the A320. This will enable CEB to offer more seats and maximize airport slots. The aircraft is capable of operating routes in excess of 5,000 kilometers or fly up to seven hours, allowing the carrier to explore new destinations like India, Russia, northern Japan and other cities in Australia. “2019 is the year we accelerate growth. On average, we will be receiving one brand-new aircraft per month which we can use to increase capacity in key markets or even launch new routes. For 2019, we expect capacity to grow from low to mid-teens,” said Lance Gokongwei, President and CEO of Cebu Pacific. The CEB fleet is currently comprised of an Airbus A321neo, 36 Airbus A320, seven (7) Airbus A321ceo, eight (8) Airbus A330, eight (8) ATR 72-500, and 12 ATR 72-600 aircraft. 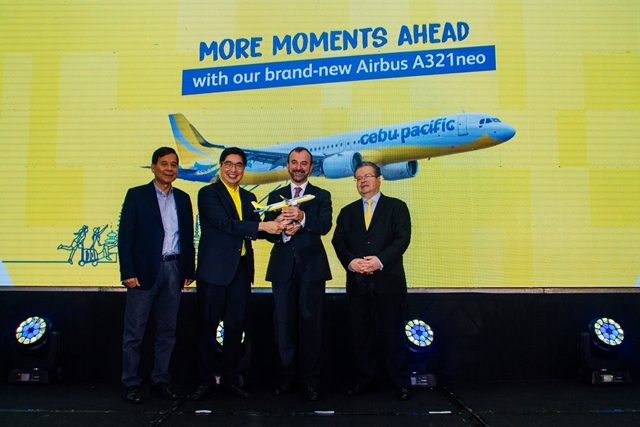 “Cebu Pacific is expanding rapidly and plays an important part in the transformation of the Philippines’ aviation sector and has played a key role in supporting tourism, trade and business links between the Philippines, the Asia-Pacific and the Middle East,” said Jean Francois Laval, Executive Vice President for Sales in Asia of Airbus. CEB is aiming to fly 200 million passengers by 2020, as it expands its route network and upgrades its fleet to bigger and more fuel-efficient aircraft. The carrier hit the milestone of 150 million passengers flown since inception in late 2017. This entry was posted in Airlines, Business, Corporate Travel, Flights, Travel, Travel Management, Travel Services, Travelers and tagged aircraft, airline, Cebu Pacific, fleet, Jean Francois Laval, Lance Gokongwei, Philippines. Bookmark the permalink.